Who has not been moved by the testimony of Amazing Grace or the poignant beauty of O For A Closer Walk With God. Paul Leddington Wright and the St. Michael's Singers use the setting of Coventry Cathedral for this beautiful recording which will set you on the path to building an historic record of great hymnwriters. Hymnmakers - Amazing Grace by John Newton;William Cowper was published by Kingsway in March 1993 and is our 21316th best seller. The ISBN for Hymnmakers - Amazing Grace is KMCD599. 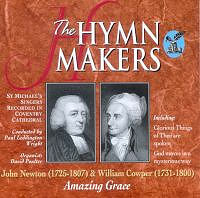 Be the first to review Hymnmakers - Amazing Grace! Got a question? No problem! Just click here to ask us about Hymnmakers - Amazing Grace. Now Playing: Glorious Things of Thee are Spoken Your browser does not support the audio element.